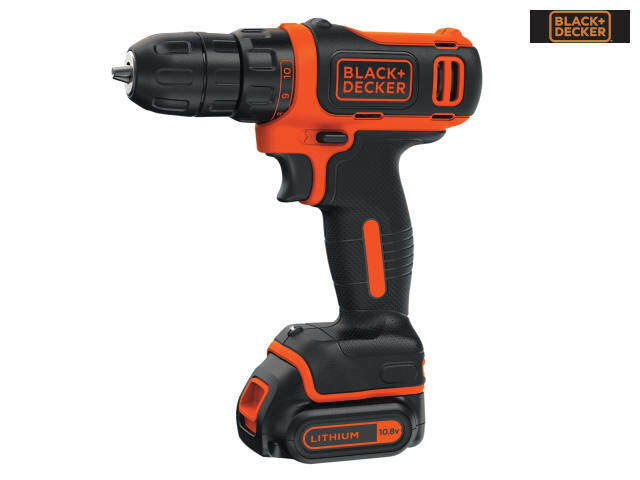 The Black & Decker BDCDD12 Ultra Compact Drill Driver is ideal for use in hard to reach, confined areas. Provides precise control for drilling into wood, metal, plastic and all screwdriving tasks. With fingertip variable speed control for all drilling and screwdriving applications. It has an anti-slip soft-grip for additional comfort and an LED work light to illuminate dark working areas. Uses a spring loaded battery system for quick and simple battery change whilst also providing a secure fit. The Lithium Ion battery holds over 80% of its charge over 90 days whilst idle. No need to charge unit before each use. 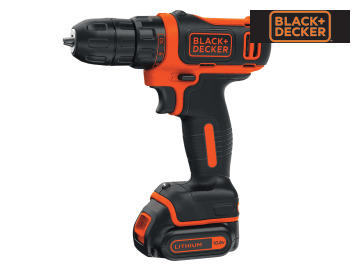 Ideal for all drilling tasks in wood up to 25mm and Metal up to 10mm. Also for building flat pack furniture, hanging pictures, shelves, curtain rails and blinds. Supplied with 1 x 10.8 Volt 1.5Ah Li-Ion Battery and 1 x 8 Hour Charger. Max Torque: 12.5/26Nm, 11 Settings.